N6-methyladenosine (m6A) RNA methylation is the most abundant modification on mRNAs. Increasing lines of evidence have shown that m6A plays important roles in various biological processes, through the regulation of RNA stability, RNA splicing, as well as mRNA translation efficiency. The formation of m6A is catalyzed by a methyltransferase complex including METTL3, METTL14, and WTAP, among which METTL3 is the most essential component. To illustrate the function of m6A in regulating brain development, research teams led by Prof. WANG Xiujie at Institute of Genetics and Developmental Biology, Chinese Academy of Sciences (CAS), Prof. YANG Yungui at Beijing Institute of Genomics, CAS, and Prof. ZHOU Qi at Institute of Zoology, CAS, collaborated to investigate the effects of Mettl3 conditional knockout during mouse development. They found that specific inactivation of Mettl3 in mouse nervous system caused severe movement disorders. UHPLC-MS/MS analysis showed that the m6A modification on mRNAs of conditional knockout mouse (cKO) brain tissues were nearly wiped out, indicating that m6A depletion may cause cerebellar developmental defects. 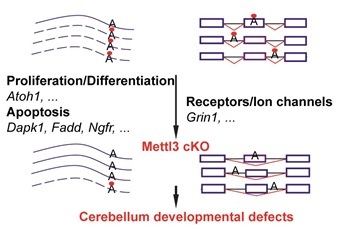 Through further immunohistological analysis they found that due to drastically enhanced apoptosis of new born cerebellar granule cells in the external granular layer, Mettl3 conditional knockout mice manifest cerebellar hypoplasia. To further investigate the underlying mechanisms for the cerebellar developmental defects in Mettl3 cKO mice, they performed bioinformatic analysis for RNA-seq and m6A-seq using mRNAs extracted from the cerebellums. The results showed that METTL3-depletion induced loss of m6A modification causes extended RNA half-lives and aberrant splicing events, consequently leading to dysregulation of transcriptome-wide gene expression and premature cerebellar granule cells death. These findings revealed a critical role of METTL3-mediated m6A in regulating the development of mammalian cerebellum. The work entitled “METTL3-mediated m6A modification is required for cerebellar development” was published in PLOS Biology on June 7, 2018 (DOI:10.1371/journal.pbio.2004880). This research was supported by grants from the Ministry of Science and Technology, National Natural Science Foundation and Chinese Academy of Sciences.